Last week we celebrated Sarah's "golden" birthday. I don't know if everyone calls it that, but that's what we call it when your age and the date of your birthday are the same--example thirteen on the thirteenth! We took her out to dinner the night before her birthday and let her open her gifts from us when we got home. She LOVED getting to open things one day early! We also got "cool parent" points. Smile. 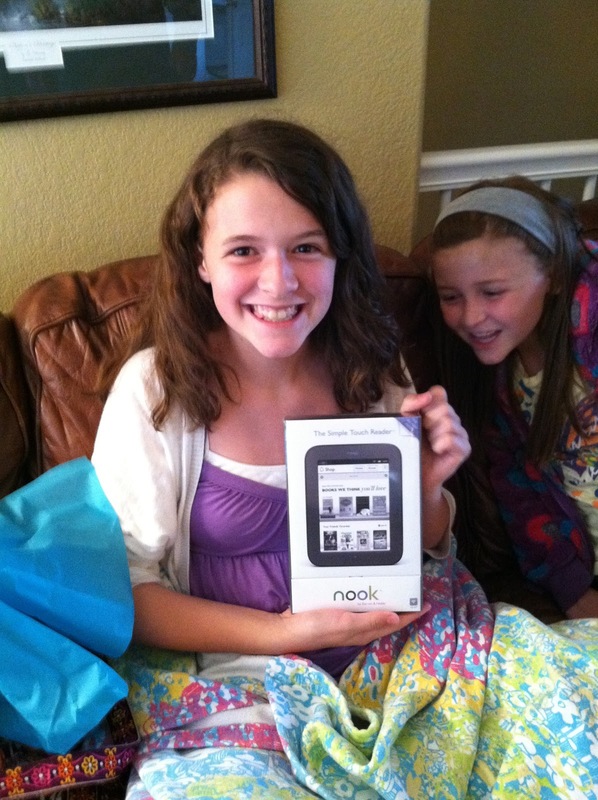 Her big gift from us was a Nook. Sarah is a HUGE reader and almost always has her nose buried in a book. She's wanted an ereader for awhile so we researched them and decided upon a Nook. She's loving it! The first book she downloaded was Waterfall (the author is a friend of ours) and once she finished that, I let her download The Help. 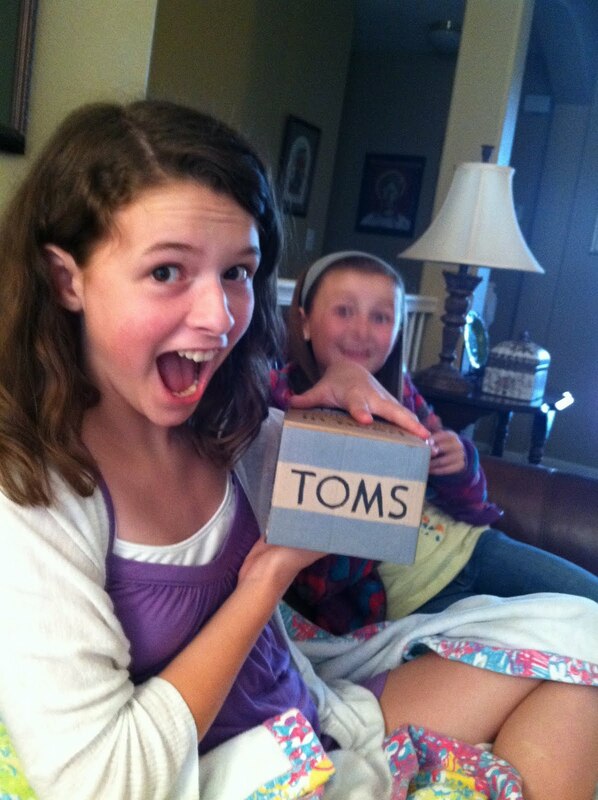 She also got a pair of TOMS and a really cute purse! I think our days of American Girl and Barbie are over...Sarah is quickly becoming a young lady. Some friends of ours gave Sarah a bouquet of thirteen gold balloons and all sorts of "golden" gifts like Golden Grahams, Rolos (gold wrappers), gold pens and gold nailpolish in a gold bag! She loved it. It was so fun!!! And so thoughtful! I felt really bad for Sarah because most of her friends were out of town the week of her birthday and that put a crimp in her big party plans. She ended up having one friend come hang out and spend the day/night with her. I took them to see Monte Carlo and with the exception of her diabetic friend's blood sugar plunging way too low from too much insulin (and scaring me half to death) they had a pretty uneventful evening! Overall it was a really low-key birthday! We love you, Sarah! You are such a bright spot in our lives and we are so proud of you! You are beautiful...inside and out! Happy Birthday, sweetie! I know it's after the fact...but Happy Belated Golden Birthday Sarah! I call it Golden too! That is such a great idea about the "golden-themed" gifts! Just to let you know...my birthday is 4 days before Sarah's. It's a GREAT month, July! How fun to celebrate a "golden" birthday! I never heard of that before, but next year Mikayla will be 12 on the 12th in 2012. That ought to be extra-special, don't you think? I like the idea of "golden" birthdays. We still have time with both kids....whew! My daughter loves TOMS!! Looks like Sarah had a fantastic celebration. Happy belated to her! I cannot believe how much of a young lady she is! My golden was my 16th. I loved having my sweet 16 on the 16th! Nathan's will be, too. Poor Sam hit gold on his 1st. I think he'll get over it. I love the Golden Birthday! 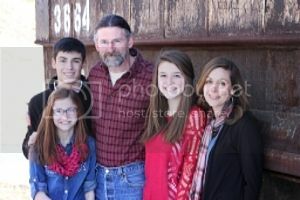 But my oldest was born on the 2nd so hers is long gone and my last was born on the 1st, which would have been last year. I still have hope for my middle child but she'll be in her 20's and I'll be senial by then. Happy Birthday to your gorgeous young lady!